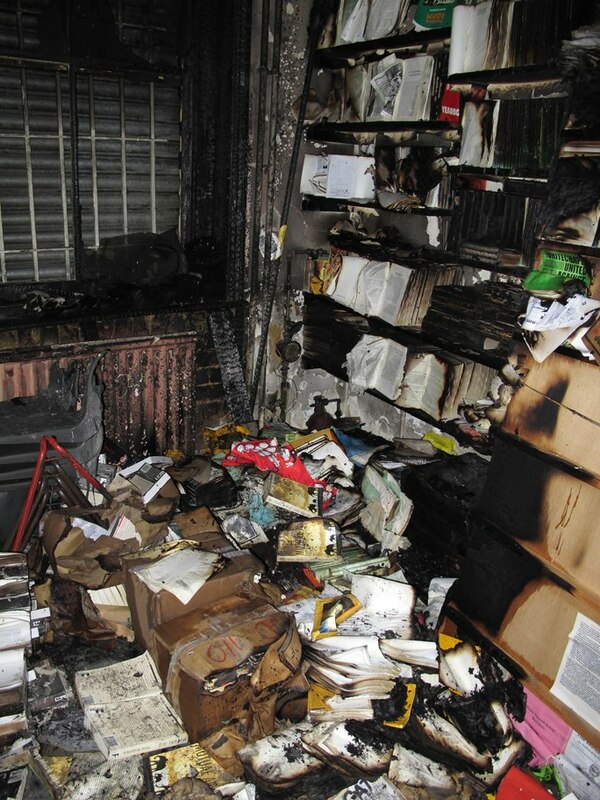 At 5:30am on Friday, February 1st London’s Freedom Press bookshop was firebombed. No one was hurt, but the shop interior and the building’s electrics are severely damaged, and crucial archives were lost. Freedom Press has been publishing anarchist literature since 1886, including the UK’s only regular anarchist newspaper, and is no stranger to controversy. For instance, in 1945 the newspaper’s editor Vernon Richards was arrested for attempting “to undermine the affections of members of His Majesty’s Armed Forces,” prompting writers like George Orwell and E.M. Forster to form a committee for the defense of free speech in the UK. Freedom Press hasn’t endured aggression from the government alone, either; as the oldest and most robust anarchist press in the English-speaking world Freedom has entered the realm of myth, making it an occasional target for the militant right. In March of 1993 members of the neo-fascist group Combat 18 raided the bookshop, destroying the interior with wooden clubs before setting it alight. No one has yet taken responsibility for last Friday’s attack. On Saturday, February 2nd I headed down to the bookstore, located at the end of an inconspicuous alley off Whitechapel High Street, to join in a community cleanup effort. When I arrived the building was structurally sound, but it appeared that about a quarter of the inventory was completely ruined, reduced to ash. Much of the remaining stock was blackened by smoke or warped by water from the fire hoses. Glass was broken, plastic chairs were melted down, and the black boxes containing 125 years of the Freedom Newspaper were charred, dealing a great blow to the press archive. Members of the Freedom collective asked us to help move the surviving books up to the third floor of the building, so we formed a chain climbing the staircase and transferred the books up five or seven at a time. We glanced at their spines as we passed them along. Some had brazen titles like Bash The Rich, but there were also books on alternative medicine, on finding community solutions to the housing crisis, on raising happy kids. There was Foucault, Bakunin, Chomsky (lots of Chomsky), Aristophanes, Ursula K. Le Guin, Charles Dickens, and Roald Dahl. There was one sooty copy of Ray Bradbury’s Fahrenheit 451, which elicited a sad chuckle as it ascended. Curiously, no one I spoke to could think of any far right groups in London that actively harass anarchist groups. There was once a time when fascist and anti-fascist fighting units brawled openly on the streets of London, but as an old militant squadist named Tim told me somewhat wistfully, that time has passed. Combat 18 lost steam in the mid-2000s due to abundant arrests and infighting that resulted in the formation of lower-profile splinter groups, none of which has caused much of a stir. The English Defense League — which this hate group watchdog organization calls the “largest right wing threat in the UK today” but which is also in decline — is primarily racist and anti-immigrant in its concerns. The energy of the British far right, I was told, is shifting off the streets and into the political mainstream — or, as student and activist Vincent phrased it, “Fascism now wears a suit” (sometimes even a tuxedo). Freedom recently published a book called Beating the Fascists, about the history of militant anti-fascism in Britain, and this led some to speculate that the arsonist might have been an old member of Combat 18 or a similar group intent on settling a score. Vincent told me there is speculation that the attack signals the emergence in Britain of groups inspired by the tactics of the militant neo-fascist Golden Dawn in Greece. Others said the crime bore all the signs of a renegade action (no graffiti, no group claiming responsibility in any way), and some suspected it was a young hooligan acting more out of rash antagonism than factional strategy. Whatever the case, when we consider that Freedom is located at the end of an obscure alley and that someone had to have been carrying petrol on them, it seems clear that the incident was politically motivated. What happened on Friday was not a regime officer tossing copies of Marx one by one into a bonfire in a public square, but it was nonetheless a book burning, an attempt to intimidate a movement or stifle an ideology by destroying its literature. Vincent and others suggested that the attacker might have simply found the first-floor windows convenient. That’s quite possible, but I’d also imagine that any arsonist would be familiar with the symbolism of burning books—we all are. To burn books is to make one of the most potent political gestures imaginable. Book burnings are at once pragmatic, since to destroy books is to destroy an important means of disseminating seditious ideas and information. But, more importantly —especially in a moment when much of what might be burned can be found on the internet — book burnings are emblematic, a figurative purging of heretical tendencies. Several people I spoke to turned up last Saturday to help salvage a resource they use regularly. Others, like me, had never been to Freedom but came out because we don’t want to see autonomous community spaces bullied out of existence, whether by rising rents, corporate competitors, state intervention or direct demolition. It’s important to have physical spaces where politically marginal literature is readily available, where people can acquaint themselves with heterodox histories and intellectual traditions outside the academy, and where a well-informed subversive politics can flourish without repression. Beyond the matter of literature, it’s crucial to defend collectively run, non-hierarchical community spaces, if only to prove to ourselves that they’re possible in a world of increasing privatization and bureaucratic regulation. If you want to help, whether in London or from afar, please visit this page to learn how.